EUGENE, Ore. – A man whose injuries in a fight led the City Council to order the closure of Occupy Eugene has died, police said Friday. He was identified as 54-year-old Rick Youngblood, of Florence, Ore.
Police said he was hurt, found unconscious and not breathing, in the fifth fight of the evening Monday at the encampment at a downtown park, KVAL-TV reported. The police said alcohol figured in the fight, which they described as “mutual combat.” Youngblood appeared to have been beaten and choked, suffering facial fractures, the police said. The day after the fighting, the City Council said the site had to be disbanded. Without setting a deadline, police have been urging campers to leave, and many have. 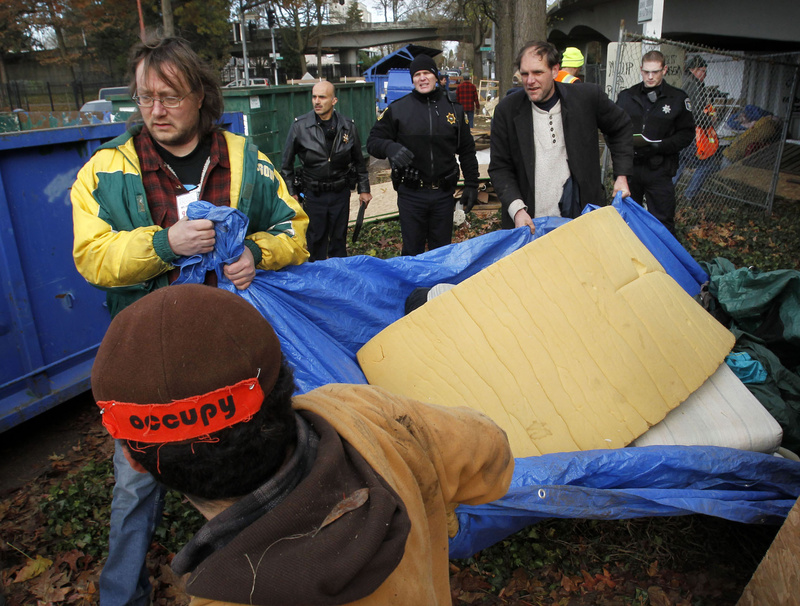 Occupy Eugene organizers say some will remain in the camp, and they held civil disobedience training this week. Meanwhile, about 70 people came in from the cold Thursday and slept at two emergency shelters. The Register-Guard said clean foam mattresses and warm pizza were available at a pavilion on the county fairgrounds. City officials plan to close the section of the park that held the camp for about six months to allow for restoration. Police Capt. Rich Stronach said the city soon will put up a fence along the park’s north side. “We’re not drawing a line in the sand because we know it’s going to take time,” Stronach said.